If you’re familiar with Independence, it’s likely thanks to Harry S. Truman, America’s 33rd President and one of the city’s most celebrated residents. 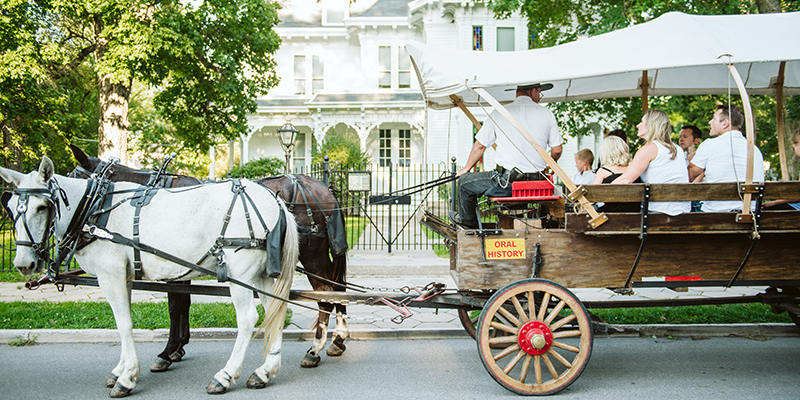 In the charming heart of Independence, you can explore Truman’s legacy and other local history in a place where past meets present. Start your Independence exploration with a tour through the Truman Home, where Harry and Bess lived before, during and after his presidency. 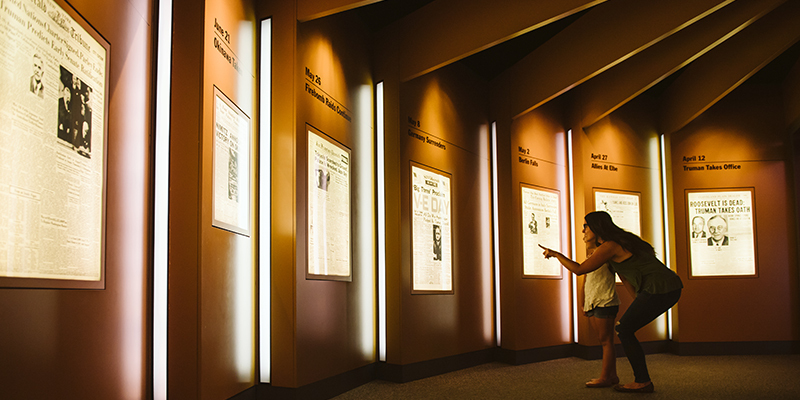 Then, head to the Harry S. Truman Library and Museum for a tour through the famed president's years in the White House. 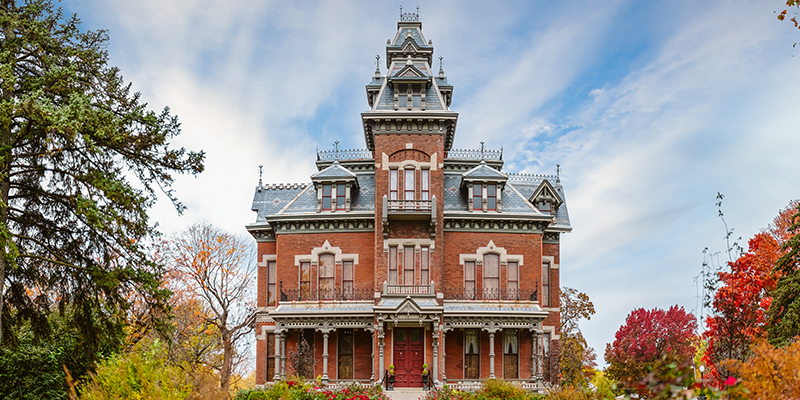 Another majestic must-see is Vaile Mansion, a three-story Gothic-like residence built by Colonel and Mrs. Harvey Vaile in 1881 that’s renowned as one of the best examples of Second Empire-style architecture in the U.S.
Tour the town like travelers of old with Pioneer Trails Adventure, a covered wagon ride trip perfect for youngsters. Take a few minutes to stop by Polly’s Pop and watch the locally made soda bottled in a street-facing facility. Quench your thirst with the local favorite, served at several restaurants on the Square. 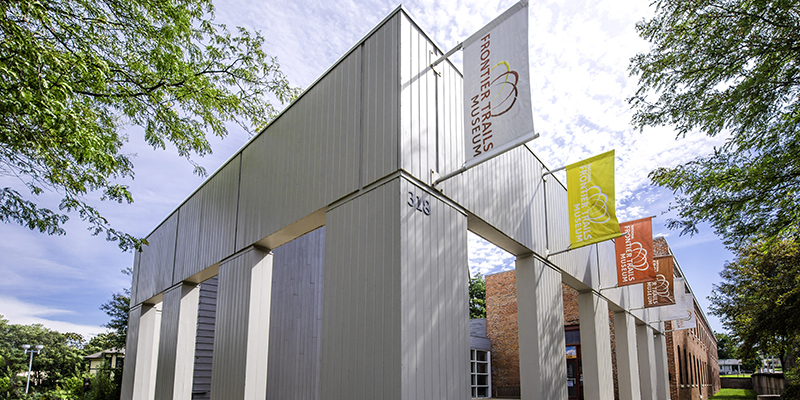 For a little extra museum time, explore the history of America's Westward expansion at the National Frontier Trails Museum, which commemorated the Oregon Trail's 175th anniversary in 2018. Historic Independence Square is steeped in history, but the revitalized district is also home to a delightfully eclectic mix of local shops. Gilbert Whitney & Co. offers gourmet groceries and kitchenware, all housed in a building that dates back to 1832. If your home needs a little TLC, find lighting, furniture, décor and more at BeHereNow. Unleash your inner artist at Primary Colors Gallery, equal parts gallery, classroom and art supply store. Our recommendation? Paint & Wine Nights, which feature wines from local restaurants Ophelia’s and Café Verona. Step inside Café Verona and you’ll first be captivated by a towering painting of Botticelli’s “Birth of Venus,” then by a multi-page menu that features indulgent Italian favorites. If the weather cooperates, grab a table on the brick-ensconced patio. And don’t forget a photo by the love locks placed on the restaurant’s gate, inspired by the Pont des Arts in Paris. The contemporary interior of Ophelia’s Restaurant & Inn blends perfectly with the restaurant’s modern, seasonally inspired cuisine. Try the Then & Now Chicken, half of which is prepared with Harry Truman’s famous chicken recipe. 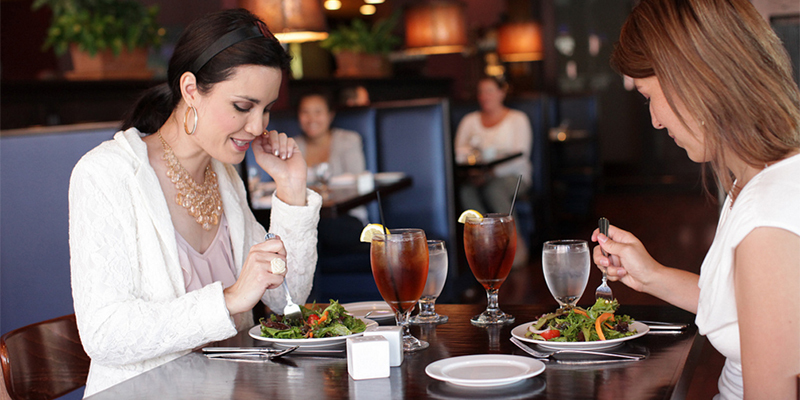 Or opt for the three-course tasting menu, a delicious—and delightful—value. If you find yourself in need of lodging, don’t fret. The Inn is upstairs, complete with fully appointed rooms that each sleep two guests. 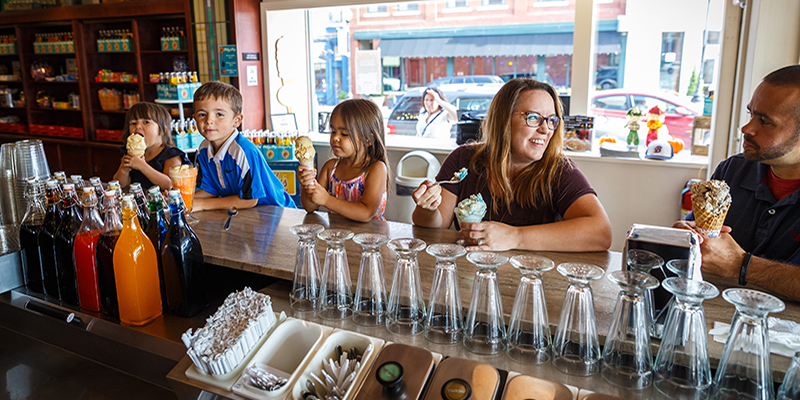 For a true taste of Independence history, grab a stool at Clinton’s Soda Fountain, which not only serves nostalgic favorites like milkshakes, malts and phosphates—it’s also the site of Harry S. Truman’s first job, where he made a whopping $3 per week! Where else to find the perfect Independence souvenir than men’s store Wild About Harry, named for President Harry S. Truman. The decidedly masculine interior is a carefully curated treasure trove of men’s accessories, books and cologne, but the shop also carries a delightful array of local history gifts, perfect for any shopper. Stay current with seasonal attractions, deals and more by signing up to receive our eNewsletter. 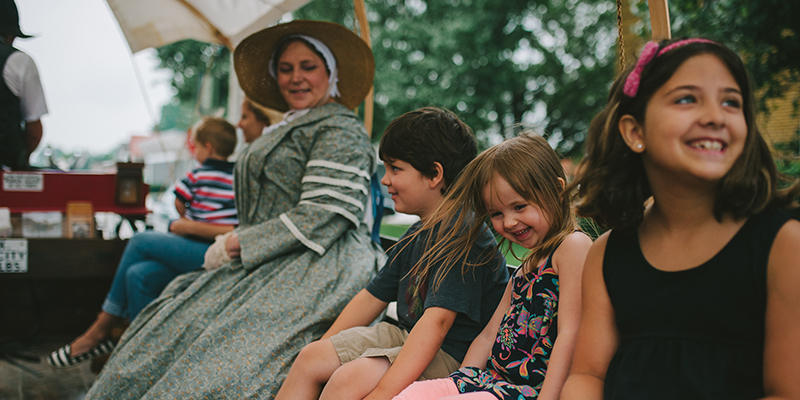 KC's Official Visitors Guide is the place to find insider tips, local favorites and info on what’s happening during your next visit. Sign up to receive email about KC's meetings industry. When it comes to your event, results matter. Here’s a look at some of our successes.